Yellowfin tuna is a member of the mackerel family and the most tropical of the tuna species. It is distinctive from other tunas by its long, bright yellow dorsal fin and yellow stripe down the sides. Also know by the Hawaiian name, ahi, which means fire, the flesh is deep red when raw and is often used for sashimi. Yellowfin tuna caught from the Western Central Pacific. A highly migratory species, it can be found in the warm waters of the Gulf of Mexico, as well as the Atlantic, Pacific, and Indian Oceans. It is also commercially and recreationally fished throughout those waters. 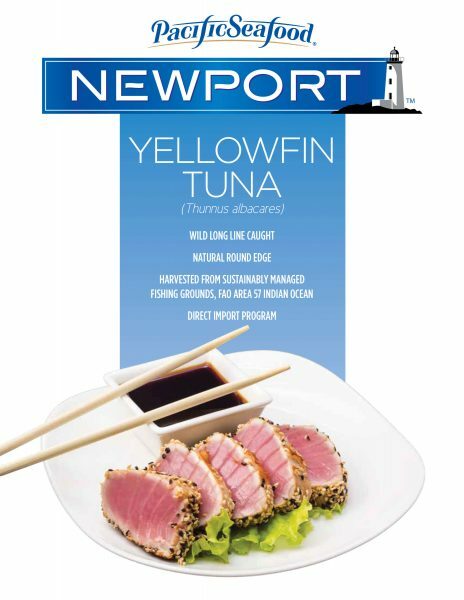 Yellowfin tuna has a medium-mild flavor with a very firm texture. It’s best served cooked rare to medium-rare and lends itself to grilling or searing.